How long can Dynamite keep up the James Bond comic book licence with plunging sales figures? MI6 has tracked per-issue sales of the new James Bond adventures since Dynamite brought 007 back to the medium 18 months ago. The initial adventure, VARGR, enjoyed a lot of hype in the comic book community as it paired together writer Warren Ellis and artist Jason Masters as a 'dream team'. Issue #1 sold a respectable 35,632 units in the USA in its first month of release in November 2015, charting at #69 overall. The launch was no doubt helped by 'SPECTRE' being released in movie theatres around the same time. To put that launch number into perspective with the wider comic book market in America, a title needs to sell upwards of 100,000 and sometimes 400,000 copies to land the #1 spot. Then came the drop. Issue #2 of VARGR was released the following month and only shifted 21,254 copies - a 40% drop off. Issue #3 was also released in December and fell again to a total of 17,730 units. 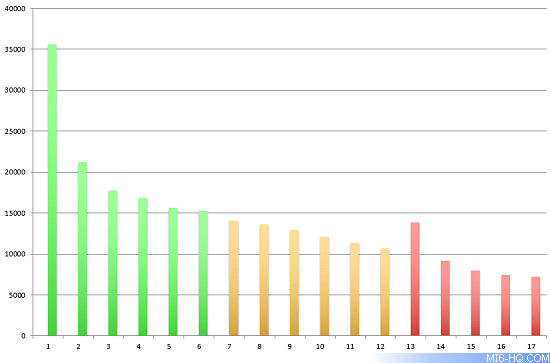 As the chart below demonstrates, with one exception, the sales for each issue in the James Bond series has declined steadily. The exception (#13 on the chart below) is the first issue of the third story Hammerhead, which was launched as 'James Bond series 2', and so attracted some additional first issue collectors. The sales figures used for this analysis came from Dynamite's distributor in the US. It does not include any digital or foreign sales. The final issue of Hammerhead (#18 for this chart) was released in March 2017 and sales figures were not available at the time of writing. The drop to circulations below 10,000 copies per issue also sees Dynamite's Bond comics drop out of the Top 200 comic book store charts each month. The new spin-off series, Felix Leiter, only managed to shift 8,261 copies in its debut issue, slumping to 6,976 for its second issue released last month. That was the lowest total for the license to date. Dynamite have also been publishing the six-issue stories as collected hardback editions. The complete VARGR was released in hardback in July last year and shipped 1,940 copies to comic stores. Its follow-up, EIDOLON, was published in the same format last month and shipped less than half the amount - only 896 copies. As well as Hammerhead wrapping up this month and Felix Leiter's spin-off having at least four more issues to go, more new titles have been committed. The first issue of a new six-part series, Black Box, will go on sale this month. A one-off longer format special 'James Bond: Service' will be published in May. 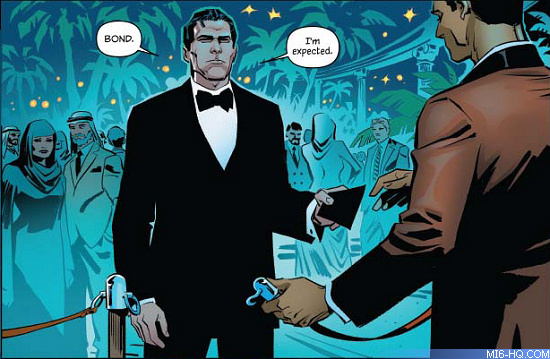 The earlier announced 'Casino Royale' graphic novel adaptation has been pushed back to July due to a change in artist. The series so far has attracted positive reviews in the comic book press, no doubt helped by Dynamite's penchant for giving them exclusive interviews and early looks whilst shunning the core Bond community. The publicity strategy doesn't seem to have worked, as regular comic book readers haven't taken to the franchise. For a lot of long-time James Bond fans, the return of the comic book adventures was warmly welcomed, especially with longer breaks between films and lack of a regular literary continuation author. Although we don't know what Dynamite's total investment is with the Bond licence, with steadily declining sales figures showing no signs of bottoming out yet, we urge fans to enjoy these adventures while they last.